BUKIT LANJAN: Hey! Health Ministry! 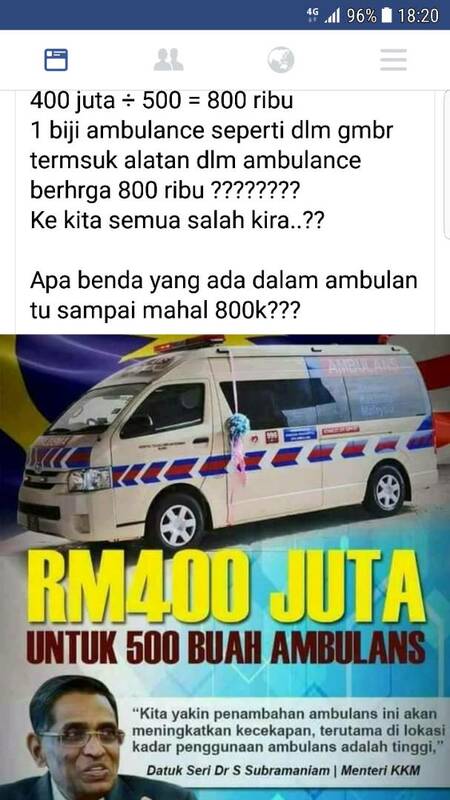 RM800,000 for an ambulance? What’s it equipped with? It was good news that the Health Ministry is in the midst of distributing 500 ambulances with new specifications to hospitals and health clinics nationwide to further enhance pre-hospital treatment and ambulance services in the country. But, the cost of each ambulance is ridiculously high - at RM800,000 each! “What’s it equipped with that it costs that humongous amount?” Gerakan Deputy Speaker Syed Abdul Razak Alsagoff asked. He said government procurement of vehicles was always cheaper because “there’s no sales tax but of course with a spacious interior fully equipped with fibrillators and other monitoring equipment would add up to the costs”. “But bumping up the cost of each ambulance to the tune of RM800,000 is way too high! Those who got this contract must be laughing all the way to the bank! No?” he added. Syed Razak said the Health Ministry must take immediate transparent action to investigate and determine the actual cost of the ambulances. “Justify the spending. Malaysians have the right to know how public money is being spent, every sen of it,” he added. Syed Razak, who is Gerakan’s nominee to contest N.37 Bukit Lanjan in the coming 14th General Election (GE14), said “if the cost of the ambulances is justified, there is no reason why the ministry should hesitate to display transparency on the matter”. “If the breakdown of the costs is justified, I am pretty sure Malaysians will accept it. After all, it is a justified project that benefits the rakyat (people),” he added. He urged the ministry to act fast to justify the spending “before action is taken by others to raise the matter with other authorities”. SHAH ALAM, Aug 7 — The Health Ministry is in the midst of distributing 500 ambulances with new specifications to hospitals and health clinics nationwide further enhance the pre-hospital treatment and ambulance services in the country. Minister Datuk Seri Dr S. Subramaniam said the distribution of the ambulances began early this month and was expected to be completed by September next year involving a total allocation of RM400 million. “The distribution, which will also include hospitals and clinics in Sabah and Sarawak, will depend on their (hospitals and clinics) needs. 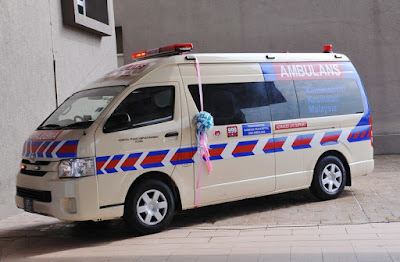 In addition, this exercise is also meant to replace old ambulances aged over 20 years,” he told reporters after the handing-over ceremony of new ambulances for hospitals around Kuala Lumpur, Putrajaya and Selangor at the Shah Alam Hospital here today. Also present were Health Department director-general Datuk Dr Noor Hisham Abdullah and Selangor Health Department director Datuk Dr. Zailan Adnan. Dr Subramaniam said said the new fleet of ambulances would have wide-bodied element, in which the patients would feel more comfortable especially for long-distance ride, and narrow-bodied element, which would be an advantage during short-distance ride, as well as during traffic congestion. “In addition, these ambulances are also equipped with high-tech and sophisticated medical equipment, including the 12-Lead ECG (electrocardiogram) Transmission and Telemetry,” he said. 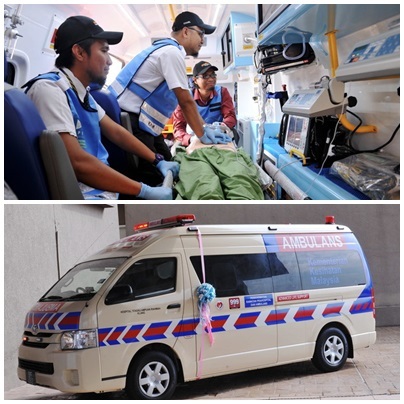 Among the hospitals which received the new ambulances at the ceremony were the Kuala Lumpur Hospital, as well as Shah Alam, Serdang, Selayang, Ampang, Kajang, Kuala Kubu Baharu, Tanjong Karang and Banting hospitals. Meanwhile, Dr Subramaniam said the Selayang Hospital and the Kuala Lumpur Health Clinic were chosen as the operations centre for athletes or officials requiring medical attention during the upcoming 29th SEA Games in Kuala Lumpur. “We’ll be on standby throughout the Games and we have (medical) personnel stationed at all the venues,” he added. — Bernama/malaymailonline"